Here’s something you may or may not have known – we are measuring the gravity levels on Mars. More specifically, NASA is measuring the density of Mount Sharp in the hope it will give new insight into the range’s formation. And most recently we’ve deployed a seismometer, the first time an instrument of this type has been placed on the surface of another planet. All of these scientific observations are a prelude to the human race someday establishing a base (and eventually a full population) on our closest neighbor. 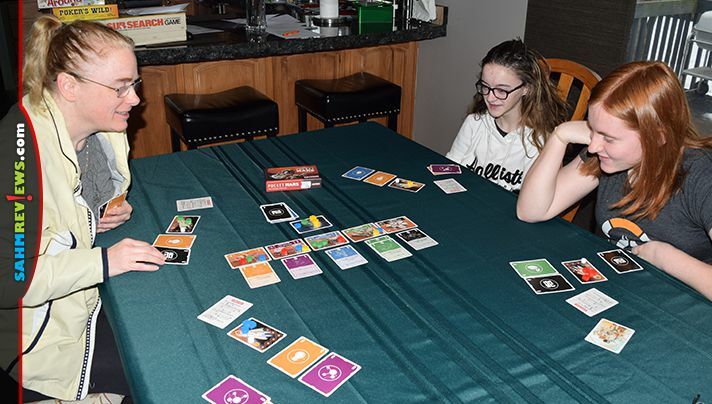 This news reminded us of a game we’ve been playing as a family since picking up a copy at this year’s Gen Con convention in Indianapolis. Pocket Mars by Grey Fox Games made its debut there in August and has had us dreaming of colonizing the red planet ever since! 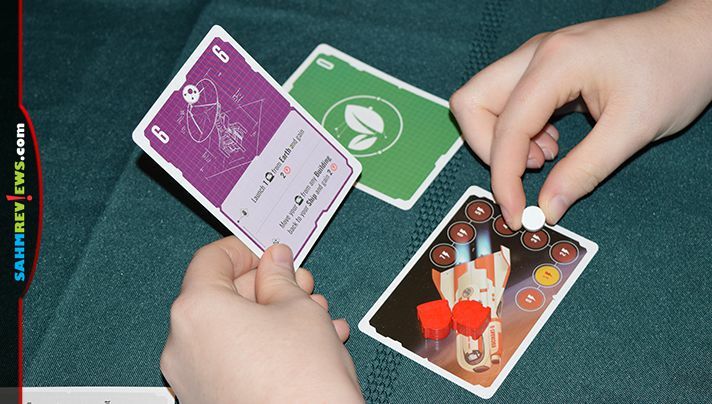 Pocket Mars is a quick card game (under 30 minutes) for up to four players. Each of you are vying to get your crew of seven astronauts to the Mars surface before the other players do the same. Instead of cooperating, each player has their own shuttle in which they will transport their team to one of the already-constructed buildings on the planet’s surface. 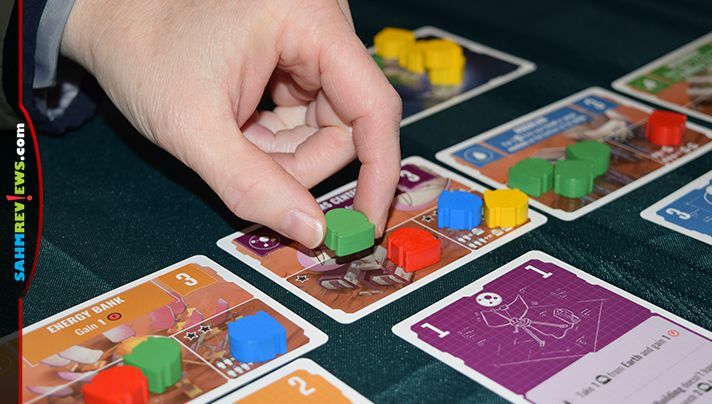 Each person begins the game with a spaceship card and colonist markers in their chosen color along with a reference card and four randomly-dealt project cards. 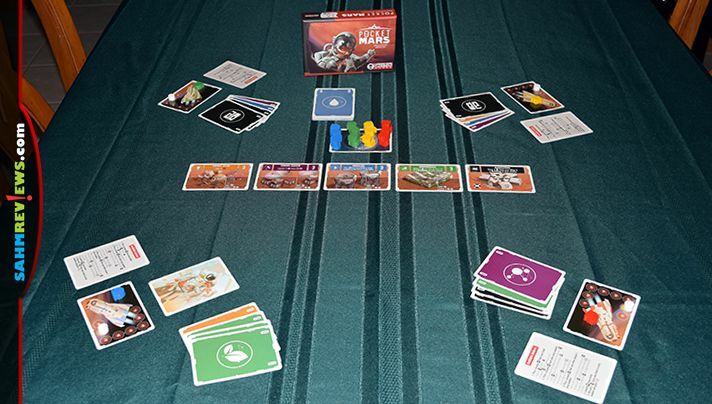 An energy marker is placed on the “1” space on the spaceship card, six colonist markers are put in a pool on the included Earth card and the last colonist takes their seat on the shuttle (spaceship card). 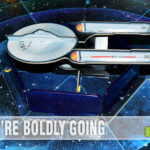 The five building cards are laid out in the center of the play area and each player chooses two of their four project cards and places them face-down next to their ship, forming a “prep area”. 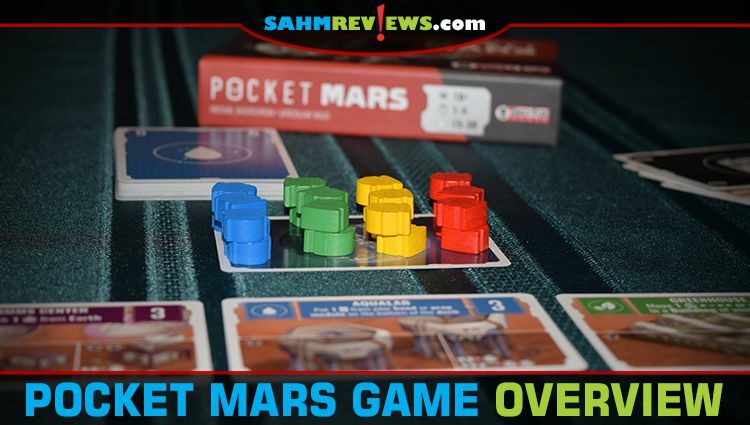 A starting player is randomly determined and the game of Pocket Mars begins! On each person’s turn they will take one action. First, they may play a card from their hand, taking the action listed on the top portion of the card’s action area and then discarding it. Instead, a player may choose to play one of the two cards in their prep area. 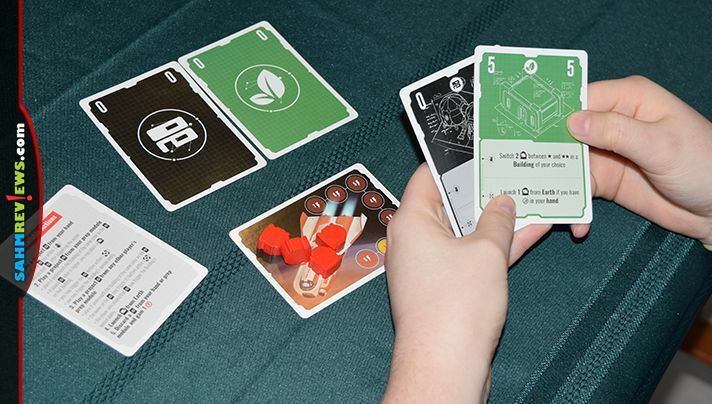 This will trigger a number of things once the card is played underneath one of the five building cards (the building will match the color of the card). If the card has a value higher than the previous card played to that building, the active player may transport one of their colonists from the shuttle to the buildings one-star room. Then they may take the action listed on the bottom portion of the card AND activate the special ability of the building (in that order). Sometimes you want to take a building’s action, but you don’t have a card of the matching color. If another player has the card you want in their prep area, you may choose to play their card on your turn as your action. No one gets to move any colonists to the planet, but both you and the person you take the card from get an action. They get to do the bottom action on the card taken while you enjoy the building’s special ability! If you don’t want to play any cards on your turn, you can always move one colonist from the Earth to your spaceship or gain an energy by discarding a project card from your hand or prep area. At the end of a turn, all players (even the inactive ones) check their project cards and make sure they have a total of four. Any that have more must discard down to four, and any that have fewer, will draw back up. After drawing, refill the prep area (if necessary) so that there are two cards in your hand and two already prepped. Card actions and building abilities will throw a little chaos into the game, allowing you to move colonists between rooms in a building (worth more or less points), spend energy to launch additional colonists or even take additional cards into your hand. Higher point rooms have occupancy limitations, so at times you’ll find yourself ejecting other players back to the lower valued room to make room for your colonist! 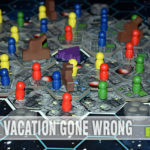 At the end of a round, if any player has all seven of their colonists placed in buildings, the game ends immediately. You’ll receive one point for each colonist still on their spaceship, two for each in a one-star room and four if they are one of the few in 2-star rooms. If you managed to get at least one colonist in all four of the available buildings, you’ll be awarded two bonus points. Get four colonists into the same building will also net you an additional three points! Lastly, the player(s) with the highest amount of leftover energy on their spaceship is also given one bonus point! Whomever has the greatest number of overall points is the winner of Pocket Mars! 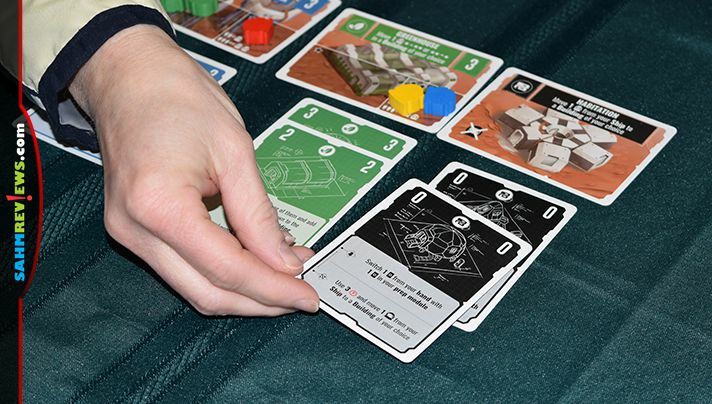 Pocket Mars is an inexpensive game requiring strategy and forethought on how to most efficiently get your colonists to the planet while considering the cards you are dealt and staying out of the way of the other players. Sometimes the cards you play will hinder their progress (good thing) and other times you’ll inadvertently help them (not good). You can find copies of Pocket Mars on Amazon or at your local game store for under $15. 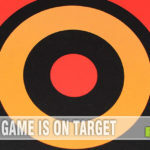 While you’re at it, check out what other great titles have been published by Grey Fox Games and be sure to follow them on Facebook and Twitter to see what’s in the pipeline! Would you volunteer to be one of the first to colonize Mars? 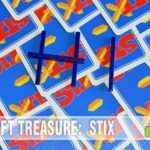 This looks like a really fun small box game! It’s always nice to have some under 30 minute games on hand. I thought we’d put a seismometer on the moon! Shows what I know. I would not volunteer to be one of the first to colonize Mars. I don’t like long plane flights and the trip to Mars would be the mother of long flights…ugh! This card game looks very fun. Thanks for sharing!